You don’t have to go to Mexico to celebrate El Dia de los Muertos. 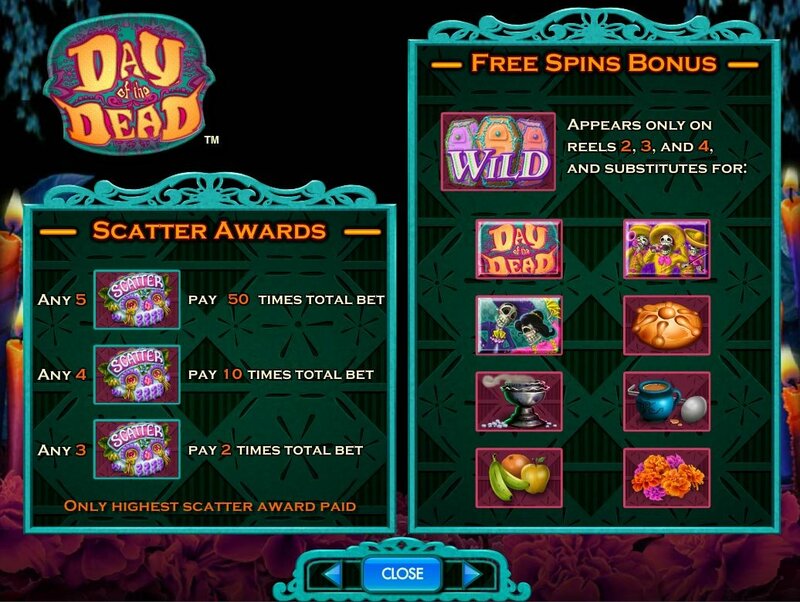 The Day of the Dead slot game brings you the best in online gaming entertainment – and best of all – you can win cash online! With 720 ways to win and plenty of bonus symbols, you may win enough to finally take that dream vacation to Mexico! Mexicans celebrate the Day of the Dead (Spanish: Dia de los Muertos) on the first of November each year. The holiday involves family and friends gathering together to pray for and to remember friends and family members who have died. 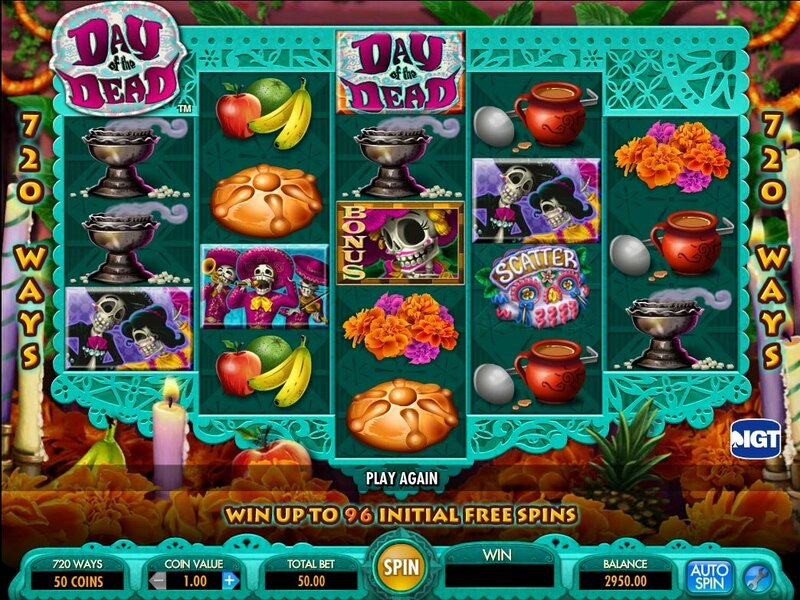 The Day of the Dead video slot offers the best of the holiday celebrations with all the alter offerings for the dead including candles, marigold flowers, candy skulls, cakes, and incense. It may seem morbid to some, but this holiday and video slot really celebrate life while honoring ancestors and loved ones who have passed on. So why not join the fun? I definitely recommend this online slot game to those, like me, who find this holiday intriguing and beautiful. Visit Mr. Green’s casino webpage to test this game, and one of the first things you’ll notice are the high-quality graphics. This one in particular features colorful, vivid images from all the way from Mexico. Skeleton mariachis, sugar skulls, candy coffins, and offerings for the dead – it doesn’t get any cooler than this. Plus, the 3D images give the graphics full dimension and really highlight the quality of the game. It may seem morbid to some, but this holiday and video slot really celebrate life while honoring ancestors and loved ones who have passed on. So why not join the fun? I definitely recommend this online slot game to those, like me, who find this holiday intriguing and beautiful. This game works a little bit differently than your typical online slot machine. 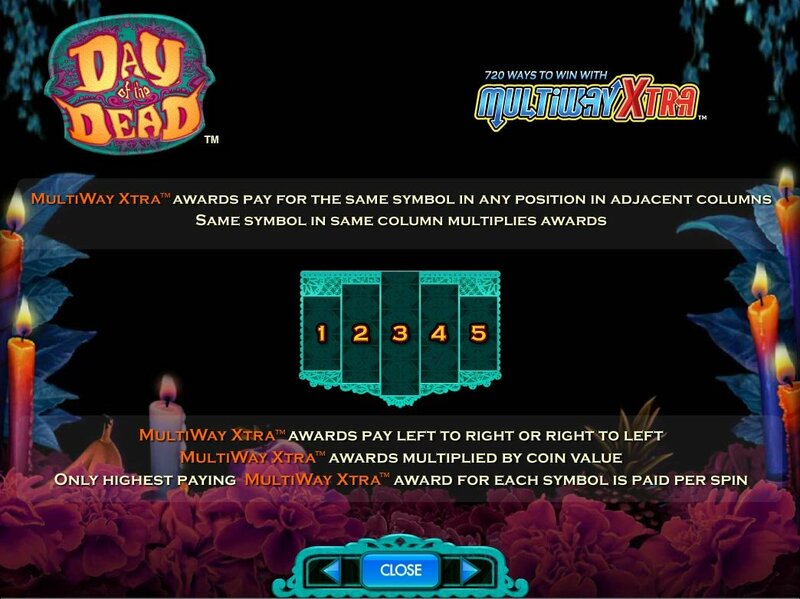 For the Day of the Dead slot bonuses, the “MultiWay Xtra” feature awards winnings for the same symbol in any position in adjacent columns. The same symbol in the same column multiplies winnings. This system allows 720 ways to win. However, players only receive the highest paying combination per spin. The colorful candy skull represents the scatter symbol. Any 5 symbols on the reel pay 50 times the total bet, any 4 scatters pay 10 times the total bet, while any 3 pays 2 times the total bet. It may be difficult to get the big payout, but if you’re lucky, you’ll surely cash in big. The candy coffins represent the wild symbol and only appear on reels 2, 3, and 4. The wild substitutes for most symbols on the reels, except for, of course, the scatter. The Lady skeleton serves as the Bonus Symbol. When this icon appears in any position on 5 consecutive reels, it triggers the free spin bonus of 8 free spins total. And check this out! If more than one combination per spin awards free spins, the sum of spins for all winning combinations is awarded at once. You could earn up to 96 free spins! Although this game doesn’t feature any bonus games or gamble rounds, the overall layout and unique game rules make this one not to be missed.